I've been having a little love affair with Mata Traders lately, and I'm pretty sure it's mostly due to Marisa. I've always loved the brand (especially that it's fair trade), but I've never had the money to buy any of the gorgeous pieces. Luckily, this is the second Mata Traders dress that I've borrowed from Marisa via Flock Together, and it's making me yearn for more of these dresses of my own. This one in particular caught my eye with its fantastic sailor-esque collar, which feels like something my closet desperately needs. I mostly just say that because I want to feel like Sailor Moon, but can you blame me? I had a little bit of trouble styling it because the collar is so eye-catching on its own, but I didn't want to cover it up with a sweater or jacket. Both Marisa and Sammi styled tops underneath it, which I adore and almost did as well, but I decided to just keep it simple for summer. A few cute accessories is really all any summer dress needs. See how Marisa styled it for all four seasons here and Sammi's take here. My favorite part about this outfit is that it cost me $0. I've been getting back into the swap Facebook group I'm part of (where we swap clothes permanently), and I got this fun bag from a swap last year. These flats were waiting for me when I got home a couple weeks ago, and they're definitely one of my favorite items to come from a swap ever. I had been lusting after these on Modcloth for a while, so when someone agreed to send me these (which are like new) for two of my thrifted items, I almost couldn't believe it. This necklace was also a freebie, this time given to me from my wonderful friend, Lexi. Lexi had a ton of jewelry she was looking to get rid of, so she let me, Katie, and Mary raid her collection, and I ended up with this seriously awesome fan necklace. It even folds up and expands like a real fan, and we all know that practicality is the mark of killer accessory. In real life news, not much has happened other than getting a haircut yesterday and watching "Harvey" with a friend, because Jimmy Stewart movies are always a good idea. I haven't had too much luck on the full-time job market, but it looks like I'll be starting an internship soon. Working for free again isn't exactly ideal, but I do still need to get an internship credit (I was hoping to get the credit from a full-time job), and this particular internship seems like a great opportunity. I'm going to wait to share until I have everything set in stone after my meeting next week, but let's just say that I'm really excited about it. Aren't these swap groups the best! I wish we had those in Bulgaria too! This is darling- I like the way the necklace emphasizes the neat collar. Good luck on the internship. You can't go wrong with a free outfit! That dress is just so adorable (: I love the collar. Looks awesome on you, Elana! This is such a versatile dress, and honestly, it never would have been something I'd have picked out for myself, but I really loved styling it, and I think it looks really good on all the girls who remixed it! Yes to Jimmy Stewart movies! 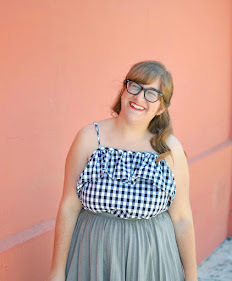 And this dress is perfect on you Elana! Loving the pop of color in the purse. You are seriously adorable and this is my first time reading your blog! It's definitely always a good idea to dress like Sailor Moon and watch Jimmy Stewart movies. I also REALLY love the fact that that necklace is like a real fan! Anything that is a miniature working version of something in real life always makes me geek out. Especially something like a miniature doll house. Eeep! I loved Sailor Moon back in the day- good luck on your meeting! I love your blue bag. It seems like the perfect color for spring. Just checked out Mata Traders... How did I not know they were fair trade? Might be buying some things from there soon. Anyway, love the unique detailing of the dress. And the fact that the outfit is free. A big bonus in my book. I'm excited to hear about more deets on the internship. :) I had a few post-grad internships myself (in journalism) before I found something full-time, so don't sweat it, grrl! This dress is so pretty on you! I love the color because it's not typical you. Also the details. Oh, and your haircut? So perfect. This is such a pretty look! even better that it was $0!! I love dresses like this for summer- cute details that don't need a lot of layers, but work with different accessories. Can't wait to hear more about the internship! What a unique collar!! I've never seen one like that on a dress before. It adds such an interesting little detail. Hey, I have the same necklace! It was my grandma's so maybe it's not the exact same but it is an expandable fan with the same floral design. So funny! AHH YES - I Totally see the resemblance to Sailor Moon. I love this look even more now. I used to be obsessed with that show! This dress is the cutest. I love the collar! Nautical details like that are my favorite. Also that swap group sounds amazing. Hooray free stuff!